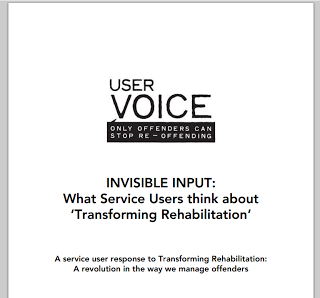 Click here to read the User Voice response INVISIBLE INPUT: What Service Users think about 'Transforming Rehabilitation'. The response uses feedback from focus groups held with 41 service users to draft recommendations for the Government to consider when finalising changes to community based rehabilitation services. The proposed changes are outlined in the Ministry of Justice consultation paper, which you can read more about here.